"To quote a renowned geneticist, 'Nothing in biology makes sense except in the light of evolution.' A quarter century ago, Randolph Nesse bravely helped apply this dictum to medicine. Now, in Good Reasons For Bad Feelings, he tackles the deeper evolutionary question of why we, our minds, and our brains are so vulnerable to mental illness. He navigates the dangers of either too much or too little adaptationism, deftly handles the false dichotomy between psychological and biological perspectives, and bridges abstract intellectualizing with pressing clinical need. This is a wise, accessible, highly readable exploration of an issue that goes to the heart of human existence." “A book as wise and illuminating as it is relevant to our daily lives." "Randolph Nesse, who trained psychiatrists for many years, has for a quarter century been a key leader of evolutionary medicine. Good Reasons for Bad Feelings integrates these two strands of his life and thought in a readable, insightful book, as much a philosophy of emotions as it is a new window on mental illness. All who want to know themselves should read it." “Clear and engaging, and the narrative reflects a masterful blend of history, novel ideas, and clinical experience in an insightful and coherent manner. I hope it is widely read and discussed." “This will become a treasured classic; not just for clinicians but for all those interested in how to facilitate well-being and create more moral communities and societies." "'Why am I feeling bad?' This is the first burning question of everyone who suffers. This accessible new book will be an essential tool to help patients, their loved ones, and treating professionals arrive at more satisfying answers." "A bold book that would have made Darwin proud. Cutting-edge and compassionate at the same time." "What is the nature of suffering, its origin and its adaptive significance? Good Reasons for Bad Feelings may well become a legend, as it is a book about psychology, psychiatry, biology and philosophy that is also a good read, and it opens the door to deep questions in a manner that is tender, quizzical, and industrious." "Very engagingly written for the general reader, Nesse's book is hugely important for the future of mental health care, and Nesse is the pre-eminent person to write it. It provides a personalized and lively but well documented treatise on how we humans function as we do and on needed changes in the way psychiatry thinks about troublesome mental experiences and behavior. It draws on an impressive range of knowledge, from not only psychiatry, including extensive case descriptions, but also psychology, biology, philosophy, and humanistic literature. Many readers will find it hard to put the book down." "Two sets of ideas inform this fine book: one, the cold-hearted logic of natural selection; the other, the practical wisdom of a compassionate psychiatrist. The tension is palpable. The result is riveting." 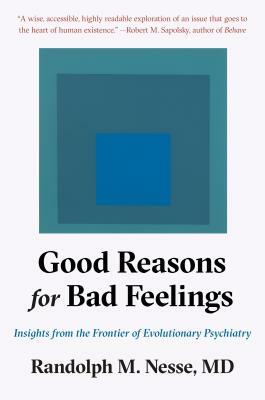 "Good Reasons for Bad Feelings by Randy Nesse is a delightful book. It is insightful about the human condition, sanguine and not over-stated. And it is written in a straight-forward and delightful manner, personal and professional, and with humor. Neese is one of the originators of the field of evolutionary medicine. This is a welcome book in evolutionary psychiatry and on the biological basis of the emotions and our cultural evolution." "In Good Reasons for Bad Feelings, leading evolutionary theorist, psychiatrist Randolph Nesse, begs us to ask the right question: Why did natural selection make us so prone to mental disorders of so many kinds and intensities? It is no exaggeration to say that he opens the door to a new paradigm in thinking about human beings and their conflicted lives. A pathbreaking book by a man who is truly humane and caring. A privilege to share time with him." "How did we end up recognizing that every system in the body has a function shaped by evolutionary selection and yet thinking that systems in the mind do not? How did physical and mental health drift so far apart? Randolph Nesse explains, in this highly readable book, how 'symptoms' in psychiatry should be seen in their evolutionary context, and that anxiety and depression for example have functions, just as do inflammation, blood clotting, or a cough. Nesse is a pioneer of evolutionary psychiatry, which has the potential to revolutionize mental health care." "This book sets out to show how evolution underpins (or should underpin) psychiatry. In doing so, it will surely change the face of medicine -- and deservedly so." "Randy Nesse has brought a new and important synthesis to the study of illnesses that psychiatrists deal in. This engagingly accessible, pioneering book provides a wide range of answers for how something as maladaptive as bipolar disorders could have evolved. It provides a wide range of answers for why natural selection has left us vulnerable to so many mental disorders, and the “mystery of missing heredity” is identified as a key problem. Nesse shows that by taking into account complex pleiotropic effects, natural selection may push some useful trait close to a fitness peak near a "cliff edge" despite the disabling consequences for a few individuals who go over the edge. Thus a gene may be useful to many, but with bad luck contribute to victimizing the few. This complex problem surely will yield to further research."